If you’ve had any issues with your tomatoes during last season or are having any now, this info and chart might be helpful. It is important to be able to identify and treat the common tomato plant ailments that might crop up. 1) BLOSSOM END ROT - This is one of the most common ailments, and you can tell if your plants have it by looking at where your tomatoes attach to the vine. If the attachment appears brown and leathery between the size of a dime and quarter, than that tomato has Blossom End Rot. TO TREAT: You will have to take all the tomatoes off the plants that are affected and dispose of them. If you don't, it will spread to all of them. Calcium is required in relatively large concentrations for normal cell growth. When a rapidly growing fruit is deprived of calcium, the tissues break down, leaving the characteristic lesion at the blossom end. Blossom End Rot develops when the fruit's demand for calcium exceeds the supply in the soil. This may result from low calcium levels in the soil, drought stress, excessive soil moisture, and/or fluctuations due to rain or over watering. Lime (unless the soil is already alkaline), composted manures or bone meal will supply calcium. 2) BLIGHT - There are 3 stages of Blight. Early Blight has black and grey spots on the leaves when tomatoes are young. Southern Blight has black and grey spots by the stem and roots of the tomato plant. Late Blight gets out of hand, and has black and grey spots throughout the leaves, vines, and tomatoes. TO TREAT: The easiest way is to treat it in it's early stages by removing the parts of the tomato plants that are infected. If you don't notice it until the later stages, you will need to buy an anti-fungal treatment, or you can make an organic one from home. 3) CATERPILLARS - They love to feed on tomato plants, so they should be taken care of right away. TO TREAT: There are many treatments available to fight against caterpillar infestations at your local garden store, but you can make your own safe organic remedies at home. An “Apple Cider Vinegar” spray can be used to keep them away. You can also plant French Marigolds by your tomatoes to help deter them from from coming around. 4) FRUIT SPLITTING - This can occur when it is dry, and then, when you get some heavy rains. Or, more frequently when there is sudden growth in the tomato plant. It doesn't hurt the tomatoes, or affect you eating them, they just don't look good after that. TO TREAT: If it occurs early in the tomato plants growth phase, it can be reversed. Just water and apply nutrients, as normal, so there's no too dry too wet cycle. If it happens near harvest, it can't be reversed. 5) RED SPIDER MITES - They are hard to spot and are usually under your leaves. If you notice cobwebs on your tomato plants, then you definitely have them. TO TREAT: You can always buy treatments at the store to take care of them, but it’s even better to make your own organic “Apple Cider Vinegar” spray, soap spray, or onion and garlic spray. Coriander, Dill, and Chrysanthemums are good to plant and these will help to deter them. 6) WILT - This is a fungal infection that starts in the roots, and blocks most of the water and nutrients from getting to the plant. It usually causes no problems until the tomatoes are growing on the vines. You will first see yellowing and drying of lower leaves, and then the whole plant will wilt during the hottest period of day. It will recover some at night, but, it will wilt again the next day. TO TREAT: If your tomato plant develops wilt, there is no treatment that I know of. It’s in the soil, so the next time you grow tomatoes, pick a different spot in the garden to grow them. It will deprive the Wilt of a host and die out over the next year. Grow seedlings inside in clean soil before transplanting in the Spring, and then make sure to pull all weeds that pop up around them. 7) SUN SCORCH - The skin of your tomatoes will looked bruised and sunken. It sometimes happens when your tomatoes get too much sun exposure during a real dry and hot period. TO TREAT: Don't do any pruning of the leaves during hot period, because the extra leaves will shield the tomatoes. You can also use a shade cloth to cover them during these periods. Once they get sun-scorched, you cannot do anything for the affected fruit, but you can provide shade for the unaffected ones. 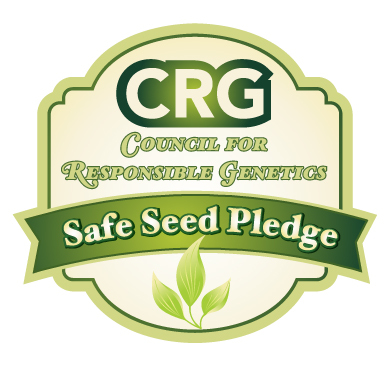 Please visit our website by clicking on the following link WWW.THESEEDGUY.NET as we have EARLY BLACK FRIDAY PRICING until November 25th on our Small Farm Grown Non-GMO Heirloom Seed Packages by clicking on the following link: I WANT EARLY BLACK FRIDAY PRICING!!! You can also call us up to 10:00 pm each night to order by phone @ 918-352-8800.